The second wine producer showcased at the recent Piemonte wine seminar I attended was definitely my favorite of the whole week’s worth of Viva Vino tastings I attended. Brunno Rocca from Alba was presented by the winemaker’s granddaughter Luisa, who also happens to run their PR and marketing. Luisa was incredibly knowledgeable and was quite fluent in English. The wines she presented us were top notch– definitely wines I am planning to buy in the near future. We began with their 2009 Dolcetto d’ Alba Trifole- a medium-bodied red with a bright, fresh bouquet. This wine had a dark ruby color and was sweet and semi-dry. Warming on the palate with just a small amount of spice, this was a very easy wine to drink, but was not my favorite of the tasting. Luisa explained that it was common to see people in the region virtually guzzle this young wine as much of what it produced never even sees bottling. The 2007 Barbera d’ Alba was much more interesting to me. Its slightly grassy nose worried me a little, but the worry subsided when this robust wine mellowed out in my mid-palate. A nice, mellow balance of tannins and acid, this wine was elegant and grown from low yield vines that are decades upon decades old. At under $25 a bottle, this wine is definitely a steal. The next three wines were my favorites. 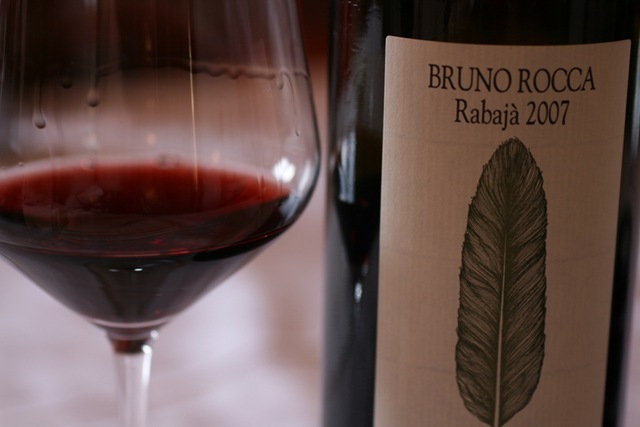 Brunno Rocca’s 2007 Barbaresco was out of this world! This bright wine was fruit-forward on the nose with strong red fruit and could really open up with some decanting. However,right out of the bottle it is still fantastically drinkable. Burgundy, almost Pinot Noir colors were vibrant, but the best thing about this was the caramel/velvety dulce de leche mouth-feel. The 2007 Rabaja Barbaresco was a little different. Not quite as great on the tongue as the former, but a little on the peppery side on the nose. High acid and mellow tannins can partially be attributed to the limestone prevalent in the area. Still a very good single-vineyard Barbaresco at $94 a bottle, but could use a couple of years to age (less than 3 years probably). Last, but most definitely not least, we tasted the mothership of Italian red wines. The 2006 EV Barolo was seriously stunning. Notes of cinnamon and spice and caramel apple came to mind with this beautiful red. Higher acidity and a smoother tannic finish. This was both riper and surprisingly softer than the 07′ Barbera d’ Alba and Malvira’s Langhe Nebbiolo. Luisa explained that younger vintages have been evolving to age in less time than when they produced Barolo many generations ago. With that comes quality and substance with vintages under 10 years of age that are drinkable in less time but also have the capabilities of blossoming and reaching their peak with proper storage and care. If you had told a vinter 100 years ago that you would be drinking their Barolos within 2-3 years, they’d deem you a fool. Now? Not so much the case. Overall, tasting Malvira and Brunno Rocca was an a delight. I impressed with both of these producers and am glad to hear that after so many years vineyards like Brunno Rocca are staying true to tradition and the integrity of their wines. No commercialized yeasts or cold macerations here folks– just tons of love, hard work, and authentic and sustainable methods.